Nov 15, 2017	Written by Kate Pilotte, Kit of Parts Manager (but really the product of work by the whole Kit of Parts Team). This is a long one; sorry for that. On the other hand, it’s a one stop shop for pre-Kickoff information about the 2018 Kit of Parts (I promise that by writing that, I’m guaranteeing at least another few updates before Kickoff to the info below, FRC Team 4042 could explain). FIRST Choice: FIRST Choice consists of an online menu of items available to 2018 FIRST Robotics Competition Teams, and it’s hosted by our friends at AndyMark (for free!). Its purpose is to make available a variety of goodies that Suppliers cannot provide in volumes to support all Kickoff Kits. Instead, Teams use a limited number of credits to pick and choose the items they prefer. Because of the limited inventory, we typically run out of popular items, but we’d rather make a variety of items in limited quantities available than none at all. the Virtual Kit: items donated by Suppliers, but don’t actually come to FIRST for redistribution. Custom orders (like Bimba cylinders), software downloads, and Product Donation Vouchers all fit this category. We’re migrating the content surrounding the FRC Kit of Parts from its home as a Resource Library page (like the 2017 content here) to a Basic Page on the FIRST website. That doesn’t need to mean anything to you, but hopefully it results in an easier-to-use resource for new and seasoned users. It’ll go live tomorrow at noon (Eastern). Please share your feedback/suggestions via frcteamadvocate@firstinspires.org. There are various ways to acquire these resources, and details will be included in the Virtual Kit of Parts section of the new Kit of Parts site when it’s posted tomorrow at noon. 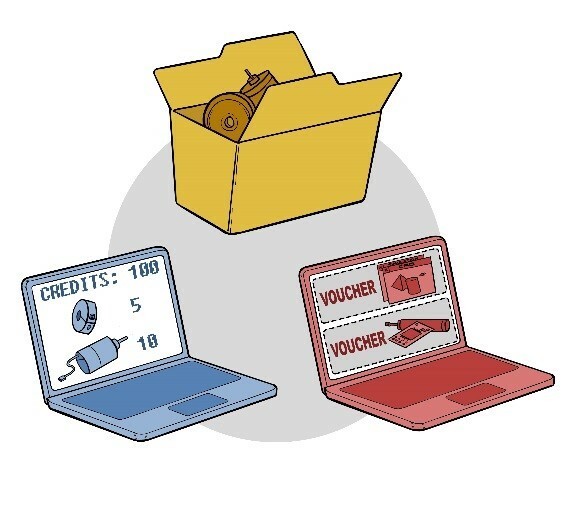 Some vouchers/licenses will require your team’s code/key/password, which will be visible to your team’s Lead Mentors/Coaches 1 and 2 in their registration accounts at the same time (assuming your team has secured payment). If you’re not secured by Thursday, don’t worry. As soon as your team’s paid up, the access codes/passwords will become live in your team’s registration account. We’ll post additional items on Kickoff day, so make sure to check back then. FIRST Choice is back with a very similar rollout to previous years. That detail is now posted in the FIRST Choice section of the Kit of Parts page, so check it out for all the nitty gritty. Based on our experience from previous seasons, we believe that what the Priority List process lacks in simplicity, it makes up for in user experience and satisfaction. The Priority List is optional, and the deadline for Round 1 Priority Lists is noon (Eastern Time) on Monday, December 4, 2017. Astute lead 1 and 2 mentors/coaches may notice that their team’s FIRST Choice login credentials will be available before Round 1. We plan to include them with the Pre-Kickoff Voucher release on 11/16. So, while you won’t be able to start your priority lists, you’ll be able to use the credentials you see to login to AndyMark’s FIRST Choice site, enter a payment method for shipping only, and add your billing and shipping addresses so you are ready to hit the Round 1 ground running. A little disclosure: Any motors you see available in Round 1; you can assume they’ll be legal on your robot. FIRST Choice login credentials available to lead 1 and 2 mentors/coaches for event-registered or secured (paid) teams. I’d like to take this opportunity to thank AndyMark for their generosity and commitment to improving the FIRST Choice experience. They donate such a valuable service, and we’re so happy they’ve continued their support. If you have any questions about this process, please feel free to ask in the comments below. Our thanks to all our Suppliers who make the Kit of Parts happen each year! HI. I am the purchasing agent for my team but not the #1 or #2 mentor. I can't look at the parts on the first choise web page. I need to be able to advise my #1 on what to buy. Please open the site to everyone and order entry to the #1 & #2. The parts available in FIRST Choice won't be live until Round 1 begins on 11/20. At that point, everyone will be able to see the items available, their credit value, etc. As you note, only 1/2 will be able to actually build/submit a priority list. Good luck! Hello. We didn't receive any login credentials on our lead mentor email accounts for logging in to choose our parts for FIRST Choice on 11/16. Where can we find the credentials? Hello, I've filled out my priority list. Is there a way for me to submit the list, or will it auto-submit once the first deadline closes? You should be good. There is no "Submit" step. Your list is saved when you click "Update," and whatever's there when Round 1 closes is what will be used in the part assignment process. So, auto-submit is the answer. You can make changes/adjustments up until it closes. How do I find out if I am round 1 or 2 priority? Re: What priority list am I on? I'm not sure I totally understand your question. We won't publish which random rank is assigned to which team's lists. All registered or paid teams are eligible for Round 1 and Round 2. If I didn't answer your question, please reach out at FRCParts@firstinspires.org. I can't seem to find how many credits are available for round 1. Where is it listed? Thanks! Teams were issued 500 credits for Round 1 (except for international teams that opted to trade some of their credits for an extra set of game pieces with their Kickoff Kits). How many additional credits will be granted at the beginning of Round 2? That information hasn't been published yet. Stay tuned closer to Kickoff. Hi, when are the Round 1 products shipped? Round 1 orders will start shipping when teams receive notification of what they’re getting, and will likely take 5-8 days to get through all of the orders. If you haven’t seen information about your shipment by 12/15, we recommend you contact firstchoice@andymark.com. We are a rookie team and have a question about the remaining credits following the second round. If you want something with your remaining credits that is more than your remaining credits can you purchase the remaining credits to get that item? Hi Colleen, no, FIRST Choice does not work with cash/credit/check/etc. Teams can only get items for which they have the credits (and if there's inventory). FIRST Choice items are stocked for Round 1, and new items are added for Round 2, but there's no added inventory added after that. So, if something out of stock, it'll stay that way for the rest of the season (that's not to say it wouldn't be out of stock with its vendor/distributor, for example AndyMark sells the Analog Devices gyro sensors). Yup! Please reach out to firstchoice@andymark.com with your order number and a description of the issue.